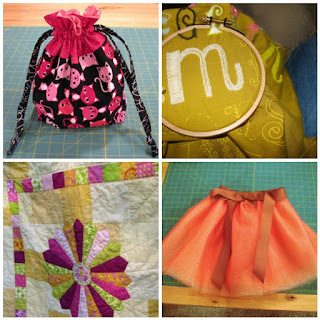 2012 was a good sewing and quilting year for me. I spent much more time sewing at home on my own, and much less time sewing socially. Our quilt guild stopped meeting, and sewing nights at my local quilt shop also ended early last year and didn't start up again in the fall. So I found myself home a lot more, and it turns out I get a lot done when I'm focused and working on my own. While I definitely like going out to sew with friends, I also love working on my own. It fills me up to have that alone time and just sink into whatever I'm working on, and I've really liked having more of that time in the last year. Sewing at home also has the great time-saving benefit of my area already being set up, so I don't have do all that packing and unpacking and lugging things in and out of the car, not to mention saving time on driving. I finished quite a few projects; some of them had been in progress for ages and it felt good to cross them off the list. I also evaluated all my WIPs and where I was at, and decided to let some of them go. I cleared out some fabric by participating in a garage sale through a quilt shop. It felt good to let go of those things, to focus on projects that I was interested in and put effort into finishing things that I was excited about...I'm still working on that this year. I also went on my first bus hop and attended two weekend retreats. I thought about skipping out on this year's block-of-the-month program at my local quilt shop because I don't really need another project on my list, but it's now the one time a month that I'm there and I like hearing about what's going on at the shop and around the region. My mom and I go together and I bring my daughter as well - my daughter and I have a lovely ritual of stopping for a donut on the way for breakfast and some nice time talking in the car together. So I decided to participate for another year (runs September - August). The BOM quilt is always very traditional and with this quilt and the one before it, the quilt blocks are at a more advanced level. I decided to do more leg-work up front and figure out how to make this quilt more "me", so that I'd be more excited and more likely to put in the time needed each month to make the block. I'll do a separate post on more of that process, but in general so far I'm glad to be making the quilt and happy with my choice. Looking back at 2012 I was very happy with the work I'd gotten done, and how many projects I'd brought to completion. As I started looking ahead to 2013 though I felt a little overwhelmed. I tend to have lots of projects in process at one time, and I'm always getting new ideas of projects I'd like to start. This makes it difficult to finish things. Looking objectively at the sheer number of things I'd like to do this year is a bit of a downer as there's no way I'd be able to finish them all, even if I was home sewing full-time! :) So, I've had to do a bit of thinking on how to find balance between working on some of my existing works in progress, finishing things, and still having time to start new things, because one of my favorite parts of quilting is the planning and then pulling and mixing fabrics, and I want that to be a part of my year. I'm working toward having a smaller fabric stash at the end of the year than I do now, and I'm also hoping to take a few classes this year - not to add any more projects to my list, but to learn new skills. So far I'm off to a good start; I've completed a couple more WIPs since the first of the year, made a few small things, started and completed a quilt top, and started a new quilt that I'm super excited about. I've also signed up for a quilt class that will be held in March. While I might not be able to keep up this pace each month, I am hoping to keep up this balance - and to do more blogging as I have lots of projects that I haven't talked about here yet. Hoping to get back on track and share those more regularly. Here's to looking forward to a year of fun (and productive) sewing!